In pursuing Zito, the Giants took the same route as the Chicago Cubs did with signing Alfonso Soriano to a $136 million deal. They offered a contract worth so much more money than what other teams had offered that Zito could not resist snapping it up. Pitchers do not usually receive as handsome a contract as do position players, because the stress pitching places on their bodies makes them more susceptible to injury. But the Giants, eager to find a new face of the franchise after leaves, felt compelled to offer Zito the most lucrative deal for a pitcher in baseball history. 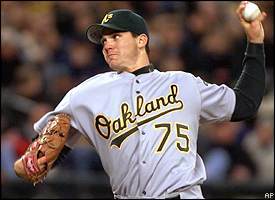 The previous largest was Mike Hampton’s eight-year, $121 million deal with Colorado before the 2001 season. For weeks, the New Yorkers in my mail stack pile up and I read nothing in them more than a couple Talk of the Town pieces and a book review or two by John Updike or Louis Menand. Then, all of a sudden, an issue comes along that demands to be read in near entirety. Friends, the December 25/January 1 Winter Fiction issue is one such issue, and its highlight is Orhan Pamuk’s Nobel lecture. Anyone who cares about anything should read it. The narrative begins when Pamuk’s father delivers to him a suitcase filled with his writings, which launches Pamuk into a meditation on his decision to become a writer and his father’s decision to not. A writer is someone who spends years patiently trying to discover the second being inside him, and the world that makes him who he is. When I speak of writing, the image that comes first to my mind is not a novel, a poem, or a literary tradition; it is the person who shuts himself up in a room, sits down at a table, and, alone, turns inward. Amid his shadows, he builds a new world with words. I would like to see myself as belonging to the tradition of writers who—wherever they are in the world, East or West—cut themselves off from society and shut themselves up in their rooms with their books; this is the starting point of true literature. But once we have shut ourselves away we soon discover that we are not as alone as we thought. We are in the company of the words of those who came before us, of other people’s stories, other people’s books—the thing we call tradition. I believe literature to be the most valuable tool that humanity has found in its quest to understand itself. Societies, tribes, and peoples grow more intelligent, richer, and more advanced as they pay attention to the troubled words of their authors—and, as we all know, the burning of books and the denigration of writers are both signs that dark and improvident times are upon us. But literature is never just a national concern. The writer who shuts himself up in a room and goes on a journey inside himself will, over the years, discover literature’s eternal rule: he must have the artistry to tell his own stories as if they were other people’s stories, and to tell other people’s stories as if they were his own, for that is what literature is. One of my favorite passages in the piece comes when Pamuk responds to the question, “Why do you write?” with every possible reason I’ve ever considered and then some. I write because I have an innate need to write. I write because I can’t do normal work as other people do. I write because I want to read books like the ones I write. I write because I am angry at everyone. I write because I love sitting in a room all day writing. I write because I can partake of real life only by changing it. I write because I want others, the whole world, to know what sort of life we lived, and continue to live, in Istanbul, in Turkey. I write because I love the smell of paper, pen, and ink. I write because I believe in literature, in the art of the novel, more than I believe in anything else. I write because it is a habit, a passion. I write because I am afraid of being forgotten. I write because I like the glory and interest that writing brings. I write to be alone. Perhaps I write because I hope to understand why I am so very, very angry at everyone. I write because I like to be read. I write because once I have begun a novel, an essay, a page I want to finish it. I write because everyone expects me to write. I write because I have a childish belief in the immortality of libraries, and in the way my books sit on the shelf. I write because it is exciting to turn all life’s beauties and riches into words. I write not to tell a story but to compose a story. I write because I wish to escape from the foreboding that there is a place I must go but—as in a dream—can’t quite get to. I write because I have never managed to be happy. I write to be happy. Zinédine Zidane spent the week in Algeria and attended a soccer match on Thursday. Setanta Sports has, unfortunately, discontinued its Setanta on Demand service for ITVN. Dan Halpern has an article on Boris Vian in this week’s New Yorker. Vian was a French author, musician, artist, champion of jazz among other things, and Halpern’s essay prompted me to order Vian’s greatest novel, L’Écume des Jours. Also in this week’s New Yorker, James Suroweicki writes about the increasing popularity of gift cards and the money we waste on unwanted gifts. He cites research that finds, in general, the amount we pay for gifts is higher than the value that their recipients place on the gifts. On the other hand, we place a disproportionately high value on unrequested gifts because we assume the givers put greater thought into them. An economist might suggest that the solution is to abandon the pretense and simply start exchanging small piles of money. The boom in gift cards is a kind of socially tolerable version of this: the cards are somehow more personal than cash, and they’re also not going to be wasted on an unwanted gift. But Waldfogel’s studies also suggest a very different solution: if most of the presents we buy are going to be less valuable in monetary terms than in sentimental ones, then there’s no reason to believe that the more expensive gift is a better gift. In fact, the more we spend at Christmas, the more we waste. We might actually be happier—and we’d certainly be wealthier—if we exchanged small, well-considered gifts rather than haunting the malls. Calculating the deadweight loss of Christmas gifts is a coldhearted project, but it leads to a paradoxically warmhearted conclusion: the fact of giving may be more important than what you give. Francine Prose reviews, with glowing praise, What is the What, the new novel by Dave Eggers in this weekend’s New York Times Book Review. The lyricism, the detail and, most important, the absolute specificity of these sentences are what make “What Is the What” so persuasive. It’s a real high-wire act, yet Eggers manages to maintain this level of intensity throughout the book as Achak and the other Lost Boys encounter minefields and massacres, loneliness and fear, starvation, disease, predatory wild animals, the seemingly endless varieties of cruelty, the sustenance of fellowship and the surprising manifestations of instinctive human kindness. What’s remarkable is that, given its harrowing subject matter, the book isn’t simply horrifying or depressing. The considerable appeal of Valentino’s personality and the force of Eggers’s talent turn this eyewitness account of a terrible tragedy into a paradoxically pleasurable experience. Reading “What Is the What” does indeed make it impossible to pretend that Valentino Achak Deng and the other Lost Boys and all the men and women and children who have suffered, and continue to suffer, fates like his do not exist. 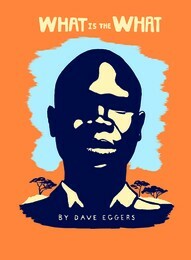 Dave Eggers has made the outlines of the tragedy in East Africa — so vague to so many Americans — not only sharp and clear but indelible. An eloquent testimony to the power of storytelling, “What Is the What” is an extraordinary work of witness, and of art. Eggers and Deng are also interviewed in this week’s NYT Book Review podcast. 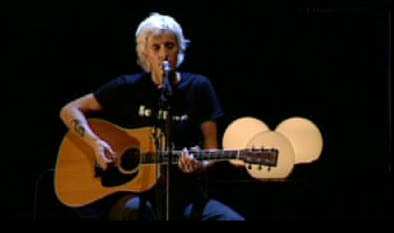 In the fall of 2000, while shopping at FNAC in Toulouse, one of the listening stations was playing the new CD, Almost Happy, from a band called K’s Choice. I’m normally not one for listening stations, but the retro style of the album’s cover caught my eye, and so I put on the headphones and had a listen. The album’s first full track, “Another Year,” immediately grabbed me, and I returned home with a copy. When I told a friend, she said, “Oh yeah, they do that song, ‘Not an Addict,'” which I didn’t confirm for another few months or so. “Another Year” became a personal anthem of sorts for returning to school that fall at l’Université de Toulouse, and it’s aged well. At the time, I imagined that this album could be hugely popular in the United States if it only got a promotional push, but it wouldn’t. And it didn’t. The band, which is composed of Sarah Bettens and her brother Gert, played a show in Toulouse while I was living there. It was good, and I remember staying until the end, but it’s the album that has stuck with me through the years, remaining one of my favorites. By chance, this morning I discovered the video of a full acoustic show from Sarah earlier this month at a place called Paradiso, which, apparently, is in Amsterdam. Her cover of Snow Patrol’s “Chasing Cars” is especially good, and demands at least ten listens. Since listening to this video reminded me of it, I might as well plug the wonderful tea salon Bapz in Toulouse, where I used to hang out and my friend Andrea used to work. The Times has an interesting story about how some recent novels by authors including Martin Amis, Norman Mailer, and William Vollmann contain bibliographies. Traditionally confined to works of nonfiction, the bibliography has lately been creeping into novels, rankling critics who call it a pretentious extension of the acknowledgments page, which began appearing more than a decade ago and was roundly derided as the tacky literary equivalent of the Oscar speech. Purists contend that novelists have always done research, particularly in books like “Madame Bovary” that were inspired by real-life events, yet never felt a bibliography was necessary. I recently read a wonderful bibliography in Joshua Prager’s The Echoing Green, but I think bibliographies for works of fiction should not be included in the novels themselves, but would certainly be apprpriate for, say, the author’s website. I missed a recent story in the NYT about the Finnegans Wake Society, which used to meet at Gotham Book Mart, until my favorite store store closed its doors a couple months ago. BN.com has an item on my Christmas list, the Lego Mindstorms NXT, for $187.46 with the coupon code B3U6E4V. That’s, by far, the best price I’ve seen so far. Yahoo! and Reuters have collaborated to solicit user-submitted news photos through Yahoo!’s new You Witness News site. Reuters may then select photos for distribution to their clients, in which case, photographers will receive small royalty payments. remember watching with delight then 12-year-old Jeffrey Maier pull a Derek Jeter fly ball over the right field fence for a home run in the 1996 ALCS when I was a sophomore in high school. According to a NYT story, Maier is now seeking a job in the front office of a Major League Baseball team, which is still where I hope, on some days, to end up. Has anyone tried the New York Times Reader Beta? I just downloaded it and will post my impressions soon. The Yankees appear closer to signing Andy Pettitte, according to the New York Times. Nintendo has dropped out of this race. The Wii has few bells and whistles and much less processing power than its “competitors,” and it features less impressive graphics. It’s really well suited for just one thing: playing games. But this turns out to be an asset. The Wii’s simplicity means that Nintendo can make money selling consoles, while Sony is reportedly losing more than two hundred and forty dollars on each PlayStation 3 it sells—even though they are selling for almost six hundred dollars. Similarly, because Nintendo is not trying to rule the entire industry, it’s been able to focus on its core competence, which is making entertaining, innovative games. 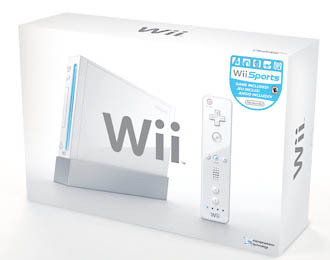 For instance, the Wii features a motion sensor that allows you to, say, hit a tennis ball onscreen by swinging the controller like a tennis racquet. Nintendo’s handheld device, the DS, became astoundingly popular because of simple but brilliant games like Nintendogs, in which users raise virtual puppies. And because Nintendo sells many more of its own games than Sony and Microsoft do, its profit margins are higher, too. Arguably, Nintendo has thrived not despite its fall from the top but because of it. I haven’t been able to get my hands on a Wii console yet, but if playing its games are every bit as fun as watching other people play its games, I suppose I should try harder to find one of the sold-out units. The last Nintendo system I owned was the Nintendo 64, which was long-delayed, much-hyped, and then underwhelming. The New York Times Book Review has picked its 10 best books of the year. There aren’t really any surprises here, though I was pleased to see both Gary Shteyngart’s Absurdistan and Marisha Pessl’s Special Topics in Calamity Physics on the list. Pessl was the only first-time novelist to be included. As usual, I’m planning to read some of the books on the list, and not others. I already have the books by Shteyngart, Pessl, Rory Stewart, and Richard Ford, so I suppose those will come first. I’m admittedly a week behind on my reading of the New York Times Magazine, so it was only last night that I read last Sunday’s excellent cover story by Paul Tough, “How to Make a Student,” which surveys the current conflict over how to address America’s education gap. Tough’s piece’s at once echoes the point made in a NYTM article that I read about six years ago–that the education gap is about far more than what schools traditionally provide students–while recounting a number of success stories of schools, particularly KIPP, that have taken the worst students and brought them up to grade-level.
. . . the evidence is becoming difficult to ignore: when educators do succeed at educating poor minority students up to national standards of proficiency, they invariably use methods that are radically different and more intensive than those employed in most American public schools. So as the No Child Left Behind law comes up for reauthorization next year, Americans are facing an increasingly stark choice: is the nation really committed to guaranteeing that all of the country’s students will succeed to the same high level? And if so, how hard are we willing to work, and what resources are we willing to commit, to achieve that goal? The old article I’m referring to argued that the education gap would persist until low-income housing areas are broken up and economically disadvantaged students share the culture that exists outside of school with their middle-class peers. If anyone can tell me the author or title of this article, please let me know. I can’t seem to remember it. Tough, in last week’s piece, focuses on the cultural and behavioral knowledge that poor students lack. In public life, the qualities that middle-class children develop are consistently valued over the ones that poor and working-class children develop. Middle-class children become used to adults taking their concerns seriously, and so they grow up with a sense of entitlement, which gives them a confidence, in the classroom and elsewhere, that less-wealthy children lack. The cultural differences translate into a distinct advantage for middle-class children in school, on standardized achievement tests and, later in life, in the workplace. Taken together, the conclusions of these researchers can be a little unsettling. Their work seems to reduce a child’s upbringing, which to a parent can feel something like magic, to a simple algorithm: give a child X, and you get Y. Their work also suggests that the disadvantages that poverty imposes on children aren’t primarily about material goods. True, every poor child would benefit from having more books in his home and more nutritious food to eat (and money certainly makes it easier to carry out a program of concerted cultivation). But the real advantages that middle-class children gain come from more elusive processes: the language that their parents use, the attitudes toward life that they convey. However you measure child-rearing, middle-class parents tend to do it differently than poor parents — and the path they follow in turn tends to give their children an array of advantages. As Lareau points out, kids from poor families might be nicer, they might be happier, they might be more polite — but in countless ways, the manner in which they are raised puts them at a disadvantage in the measures that count in contemporary American society. When we overlook the success that is possible, we become our own worst enemies. We stand by as millions die each year because they are too poor to stay alive. The inattention and neglect of our policy leaders lull us to believe casually that nothing more can be done. Meanwhile we spend hundreds of billions of dollars per year on military interventions doomed to fail, overlooking the fact that a small fraction of that money, if it were directed at development approaches, could save millions of lives and set entire regions on a path of economic growth. It is no wonder that global attitudes toward America have reached the lowest ebb in history. It is time for a new approach.